Quilting is one of most exciting forms of artistic expression. It needs a sewing machine which fulfills quilter’s needs and gives their imagination free rein. Let you creativity run free as you experience the PFAFF® quilt expression™ 4.2 sewing machine! All it takes is one look at its unique design to understand that it is a sewer’s dream. With its origin in German tradition, it fits perfectly in the new generation of PFAFF® sewing machines. Get ready to enjoy what the name PFAFF® stands for. The Original IDT™ – Integrated Dual Feed only from PFAFF® for over 45 years! Absolutely even feed of fabric from the top and bottom. 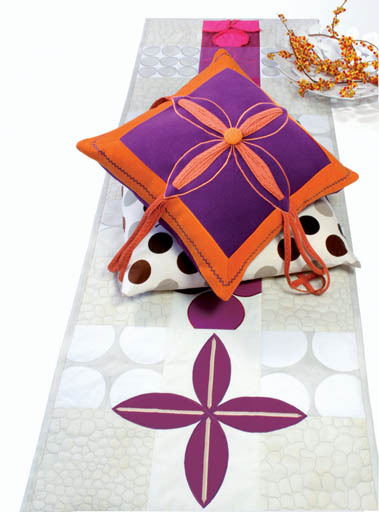 The IDT™ system is ideal for the quilter and sewing. This system works with any stitch forward or reverse at any stitch length or width. The original IDT™ system from PFAFF® is built right into the machine. It can be easily engaged or disengaged when needed. German Innovate Design – built to make sewing easy and to achieve the professional results that sewers want. The PFAFF® quilt expression™ 4.2 with its innovative features, durability and ease of operation will do it all for you. 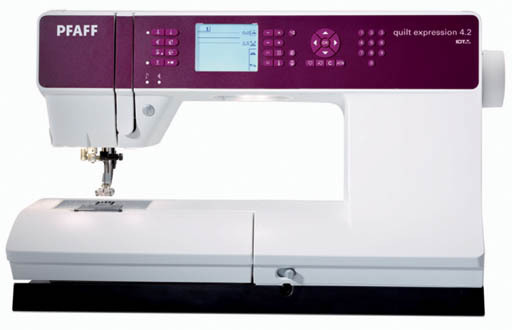 Large Sewing Space – The PFAFF® quilt expression™ 4.2 sewing machine is the right choice for quilters, home decor sewers, fashionistas – anyone who loves to create. The sewing area to the right of the needle is super-sized for large sewing projects. Quilting your quilts has never been easier. Illuminated Graphic Display – The display screen shows the stitch in actual size and all important information. Dual LED Lights – Optimized bright lights illuminate your entire sewing area without shadows. Thread Snips – Automatically snip the top and bottom thread with the touch of a button. 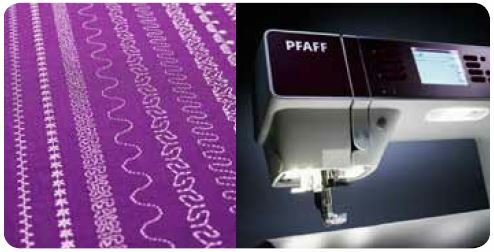 You can also program your PFAFF® quilt expression™ 4.2 to snip the threads in a sewing sequence. Automatic Presser Foot Lift – Raise the presser foot to pivot automatically when the needle is set to the down position. The presser foot lifts at the end of a seam and after a thread snip. Extra Presser Foot Lift – Raise the presser foot to its highest position so that thick fabric can be easily placed under the presser foot. Stitch Restart – Instantly returns to the beginning of your selected stitch, sequence at a touch of one button. No need to reset your special adjustments. Needle Threader – The integrated needle threader makes threading the needle that much easier. Bobbin Thread Sensor – The sensor alerts you when your bobbin thread is running low. Needle Up/Down – Touch a button to set your needle to automatically stop up or down in the fabric for pivoting, applique and more. Mirror Image – Flip the stitch from side-to-side and/or end-to-end, for more creative possibilities. Sequencing – Combine and save up to 40 stitches and/or letters into one of the 20 sequence memories. Personal Stitch Setting – Change the setting of a built-in stitch to your personal liking and save it one of the 20 personal stitch memories..
Tie-off – When selected the PFAFF® quilt expression™ 4.2 will tie-off automatically at the end of a sew for a quick and easy finish. 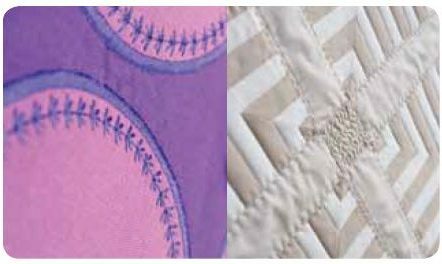 Stitch Width Safety – When engaged the PFAFF® quilt expression™ 4.2 will limit stitch width to center needle straight stitch while using straight stitch needle plate and/or straight stitch foot to prevent needle breakage. Bobbin – For ease of access, change your bobbin from the top. Start/Stop – Sew without the foot control! makes sewing long seams, free-motion and buttonholes easy. 2 Built-In Fonts – Choose a font to personalize your project. Decorative Stitches – Select from a wide variety of beautiful high quality stitches – over 250. Including but not limited to utility, button holes, 9mm wide decorative, quilt, cross and hem stitches. Stitch Density – The stitch density control adjust the density, the distance between stitch points that make up the entire stitch. Density can be increased or decreased without affecting stitch length. Stitch Positioning – Moves complete stitch to the right or left to align decorative stitches. Tapering – Taper all 9mm decorative stitches – Gradually increase or decrease the width at the beginning and/or at the end. Choose different angles for more creativity. Mirror Image – Flip the stitch side to side and/or end to end for more creative possibilities. 37 Needle Positions – Variable needle position for precise stitching. Perfect for top-stitching, quilting, zippers and more! Info Button – Simply touch to see important sewing recommendations on the illuminated graphic display screen. Needle Up/Down – Set the needle to stop up or down in the fabric for pivoting, applique and more. Sensormatic Buttonhole – Makes beautiful repeatable buttonholes on any fabric. Three Free-Motion Modes – Different modes for free-motion quilting, thread painting or darning! Select the best mode for your sewing project. External Feed Dog Drop – Convenient location to lower the feed dogs from the front of the machine. Ideal for stippling, free-motion embroidery or darning. Optimized Feeding – Enhanced to provide more control when sewing through thick layers and seaming small pieces. Electronic Thread Tension – Needle thread tension is set electronically for different stitches – makes sewing fun. Program Sequencing Commands – Program Stop, Thread Snips or Tie-off into a stitch sequence. Your sequence does exactly what you want every time you want it to. Speed Ranges – Adjust your sewing speed for specialty threads, techniques or personal taste. Languages – Choose from different languages in the Settings menu. Make sure your PFAFF® quilt expression 4.2 speaks your language. Stitch Sequencing and Memories – Combine and save up to40 stitches and/or letters in one of 20 personal stitch memories. Electronic Knee Lift – Raises the presser foot with an easy movement, allowing you to keep your hands on your project. Large Stitch Plate – Markings to the left and right of the needle help you guide your fabric. Permanent Reverse – When engaged, your hands are free to guide your fabric. Snap-on / Snap-off Presser Feet – Changing the feet is a breeze. No screws or other tools are needed – just snap it on or off. Button Ruler – Quickly determine your buttonhole size by measuring it with the buttonhole ruler. Two Built-in Spool Pins – For twin needle or specialty sewing. Warranty – 20 yr. casting, 5 yr. electronics, 1 yr. labor. It is a truly great machine to sew with. Stop in today for a demonstration. Once you have stitched on a PFAFF®, you will take one home.